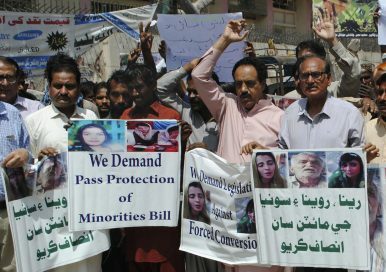 Pakistani civil society activists call for protection of Hindu girls at a protest in Hyderabad, Pakistan, Tuesday, March 26, 2019. A court in Islamabad has ordered protection for two teenage sisters from the minority Hindu community as investigators widen a probe to determine whether the girls were abducted and forced to convert and marry two Muslims. The Islamabad High Court issued the order on Tuesday. Placard at right reads, "Justice for the families of Reena, Raveena and Soniya." A Pakistani court placed two teenage sisters from the minority Hindu community in a government shelter on Tuesday as authorities launched an investigation into whether the girls were abducted and forced to convert and marry two Muslim men. “At present, forced conversions are too easily — and too often — disguised as voluntary conversions, leaving minor girls especially vulnerable,” the commission said. By Munir Ahmed for The Associated Press.